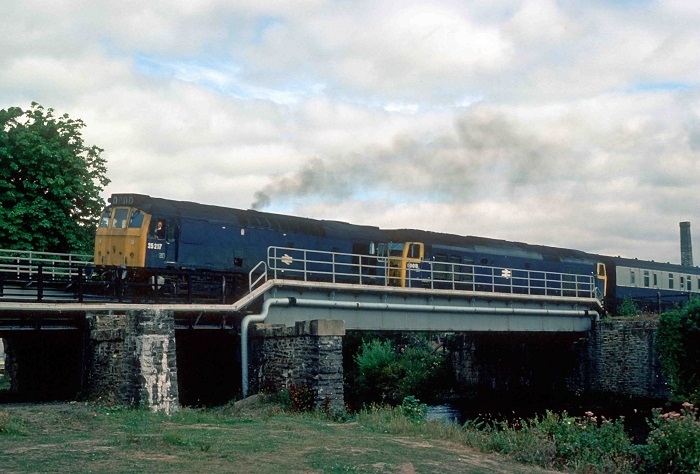 Photograph courtesy Roger Geach 25217 assists 50018 and the 08.42 Plymouth - Penzance at Lostwithiel on July 30th 1976. The fifteen year career of D7567/25217 included allocations to Scottish, Western and London Midland Region depots. 25217 was the 93rd Class 25 withdrawn, one of twelve retired during February 1981. After withdrawal 25217 was stored at Crewe until moved to Derby Works during April 1981 and scrapped there by the third week of January 1982. Noted Derby Works November 1979 (N6 repairs). On the evening of May 25th 7567 was stabled at Willesden. 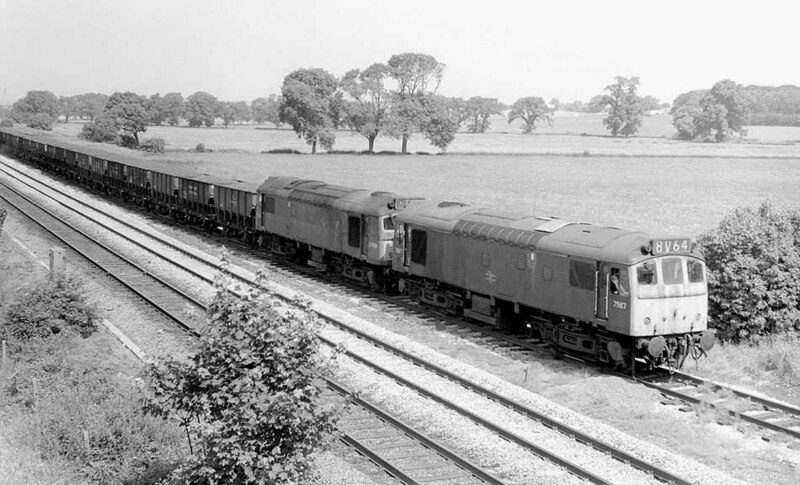 Photograph collection Steve Jones / old buffers.com 7567 and sister at Elford. The new roof panels at one end of the engine compartment suggest 7567 has recently had the exhaust port relocation completed. The other Class 25 still has the exhaust port in its original location. 7567/25217 spent about eighteen months allocated to Scottish Region depots, only one passenger working for that time has so far been recorded. On June 1st 1974 25217 worked the 20.46 Dundee - Glasgow Queen Street. 25152 & 25217 worked a Poole - Newcastle on September 8th, presumably from Birminmgham New Street, returning south the next day with a Tyne - Toton freight. During October 1975 25217 was transferred to Laira, from time to time its duties would cover the Barnstaple - Exeter - Paignton - Plymouth area passenger workings, primarily during the summers of 1976 & 1977. On November 21st 25217 was working a short train comprised of Test Coach 975046, a long wheelbase vehicle and 975076, being noted at Aller Junction and later on Dainton Bank. 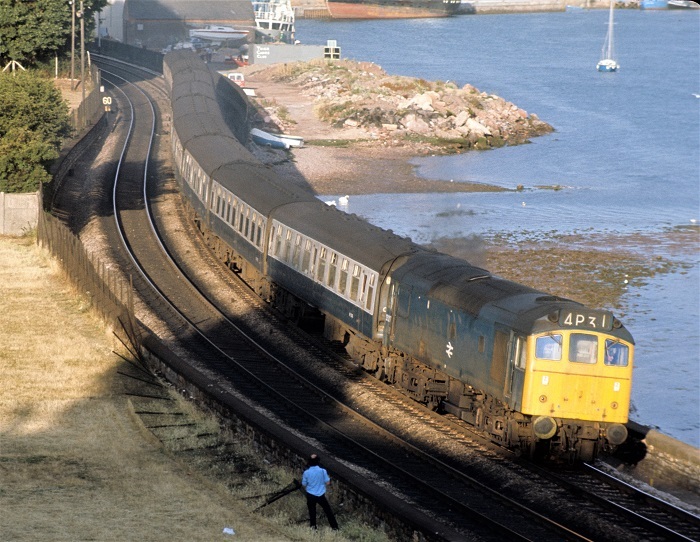 Photograph courtesy Bernard Mills 25217 passes Shaldon Bridge, west of Teignmouth with the 19.00 Exeter - Paignton on July 9th 1976. On July 30th 25217 was noted at Lostwithiel assisting failed 50018 and the 08.42 Plymouth - Penzance. About midday on August 3rd 25217 was noted with a down clay working at Lostwithiel. On November 21st 25217 was noted between Aller Junction and Newton Abbot hauling/propelling a number of test vehicles. Photograph courtesy Peter Wilmott. 25217 with its non-standard numbers manouevres around Exeter signing on point sometime during 1976. The wasteground behind the locomotive was a storage point for the motor vehicles brought in by train, and prior to their distribution to local car dealers. 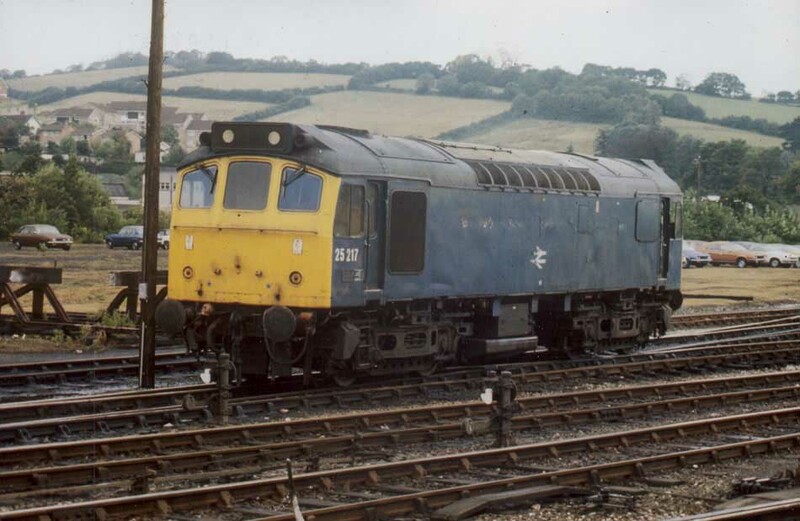 Some of the diagrams were busy, on July 31st 1977 for example 25217 worked the 09.50 Exeter St. Davids - Paignton, a Plymouth - Paignton, a Paignton - Exeter St. Davids and a Barnstaple - Exeter St. Davids. The next day 25217 worked the 18.15 Paignton - Bristol Temple Meads. Almost at the end of the summer timetable on the 09.48 Paddington - Newquay was worked between Plymouth & Par by 25217 & 25215, at Par 50037 took the train forward, the Class 25's returned to Plymouth on the 10.30 Newquay - Paddington from Newquay (?). During March 1978 25217 was transferred to Crewe although no passenger workings have so far been recorded for 1978 & 1979. On May 25th the early morning Toton - Eastleigh freight was worked at least as far as Oxford by 25217. 25217 was noted at Wakefield with the Healey Mills breakdown train on June 12th. On June 16th 1980 25217 worked the 13.40 Manchester Victoria - Llandudno Town, the 16.42 Llandudno Town - Crewe and the 20.30 Crewe - Bangor. A month later on July 19th 1980 the 10.20 Manchester Victoria - Llandudno Town and the 13.48 Llandudno Town - Llandudno Junction were worked by 25217. On August 12th 1980 with sisters 25216 & 25217 on the 13.00 Holyhead - Euston as far as Crewe. The last passenger working for 25217 took place on October 18th working the 07.54 Crewe - Cardiff. Photograph courtesy Colin Webb. 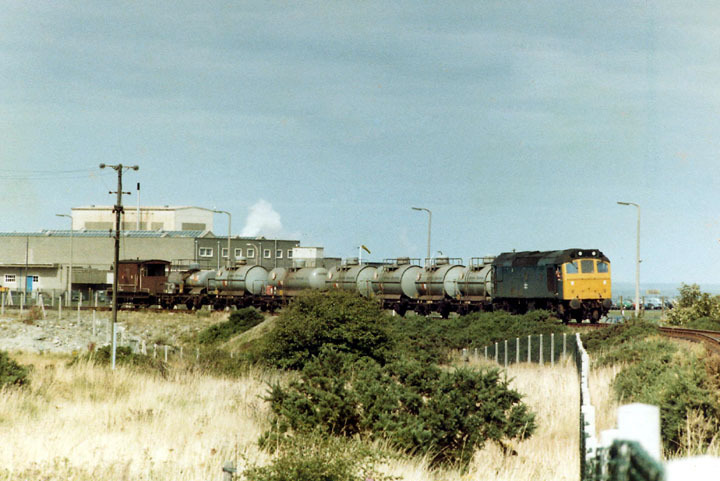 25217 with the Amlwch tanks on August 28th 1980. 25217 was withdrawn on February 1st 1981. Last updated April 16th 2019.